A quick and easy dinner for when you’re in a rush. I love serving these with a few sides like some salad, potatoes, coleslaw and/or dipping sauces. I added them to beef sauce and served with steamed vegetables. So easy to prepare a fast meal at home. These weren’t too bad. Could do with some more flavour. I chopped a couple up and mixed them through a salad with some aioli dressing. Great lunchtime meal. It is a good product however, not best but in a small budget it can be a good meal for the whole family, specially when someone has a short time. to make meatballs from scratch and they are great for the school holidays when your busy going out and come home tired. Bonus is you can add your favourite pasta sauce if you dont like eating them on they’re own. We bought these and ended up adding them to spaghetti bolonaise. My daughter wouldn’t try them, because they aren’t ikea meatballs haha, but hubby and I thought they were ok. They cook quickly and had s nice garlicky flavour. They’d be great for a small get together with dipping sauce. 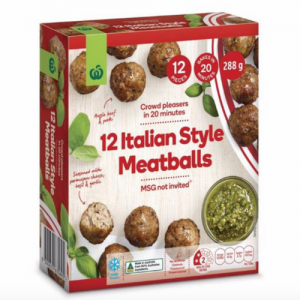 How would you rate Woolworths Frozen Italian Style Meatballs?